Krazy Kattle is coming along nicely. The herd has grown to 15. 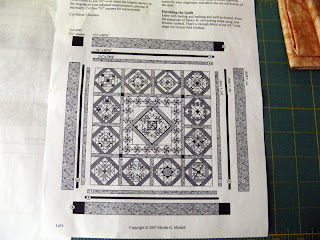 There are two different ways I am considering for the layout. 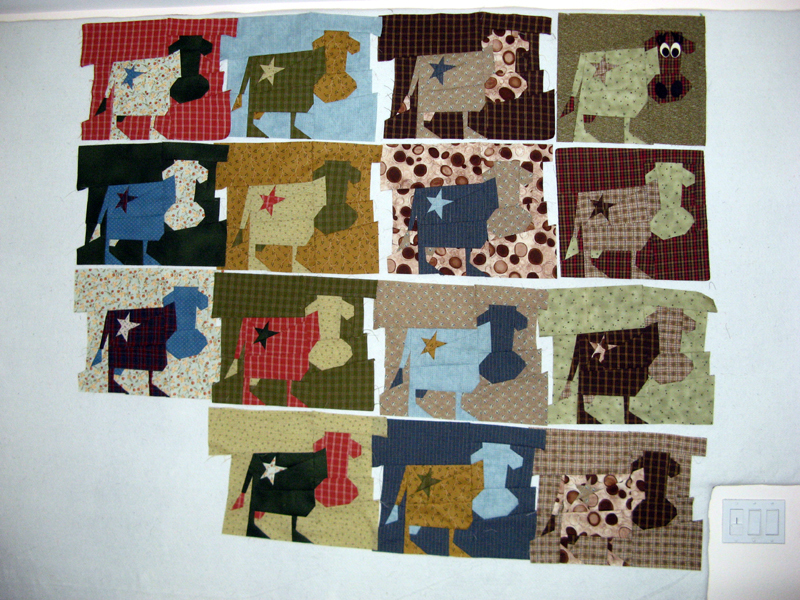 In the pattern by Buggy Barn (Crazy 'Til the Cows Come Home) there are 18 cows, a barn, and the farmer's house. The barn is placed in the top right and the farmer's house on the bottom left. 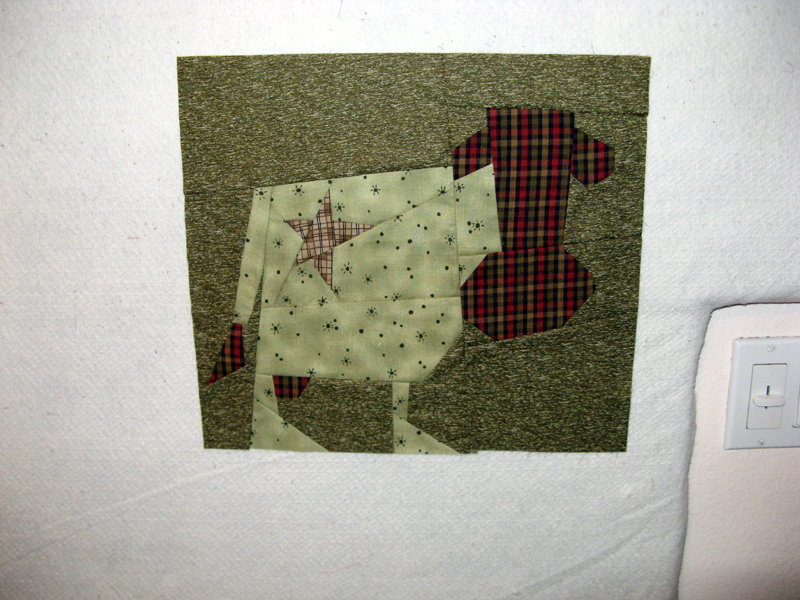 If I go this design I have only three more cows to make... The second layout which was presented in the class has no houses, 20 cows, and a picket fence border. 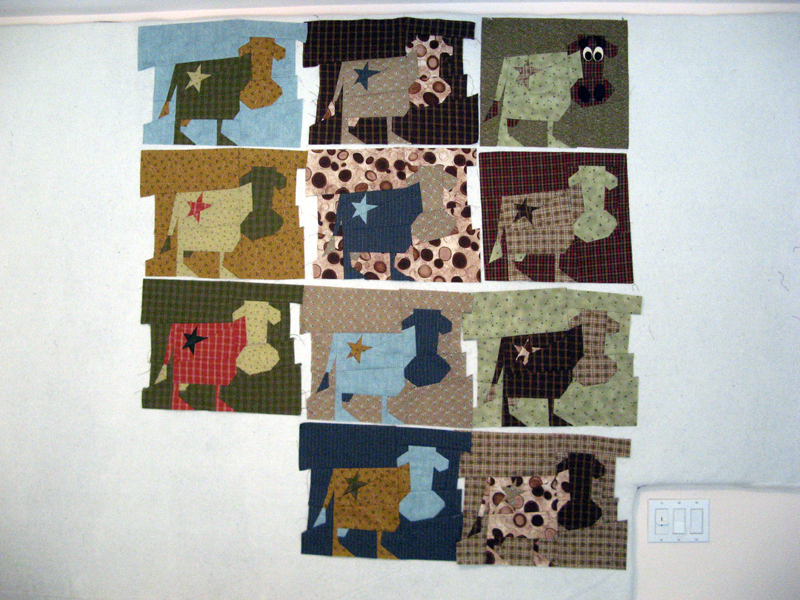 I have six more cow blocks cut so I can do either design. The barn, farmer's house, and picket fence border haven't been started. Decisions!!! Can you guess what I am working on while making Krazy Kattle? Need a hint? 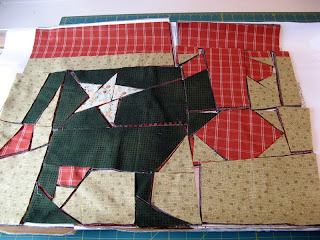 Krazy Kattle can not be chain pieced...is that enough or do you want another? If you guessed right you would have been saying Bonnie Hunter's newest challenge "Summer 2013 Leader and Ender Challenge! 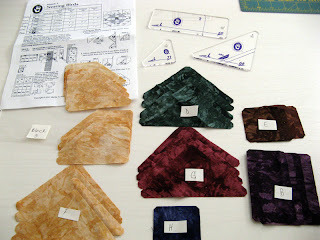 Split 9 Patch!" 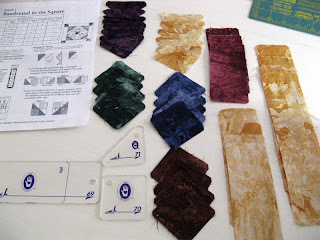 I need to do something with my 2 1/2" strips and squares too. 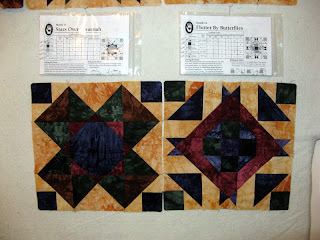 I really like the Perkiomen Valley Split 9 patch quilts she shares with her instructions. I have set out to make one for myself. Have no idea how big this project will end up, but I'm going to go until I can see the bottom of the 2 1/2" storage container. It will be great to use up this stash. 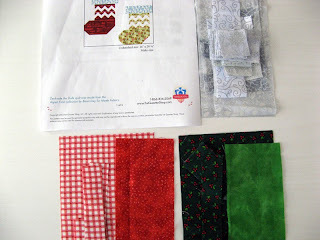 If you are interested in this challenge you can go to Bonnie Hunter's website and print it off for free. 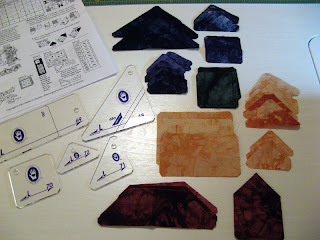 Today I will continue to work on Krazy Kattle. 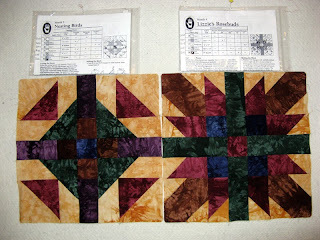 Still much debate on whether to make my quilt as designed by Buggy Barn or as presented in class. Buggy Barn has two "house" blocks without a picket fence and the class project left the houses out adding a picket fence. 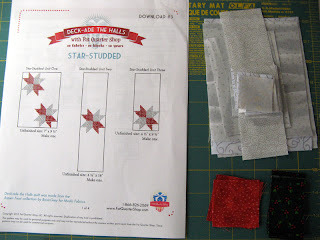 This afternoon I have plans to meet up with several Sunshine Quilt Guild friends and share our Deck-ade The Halls progress. 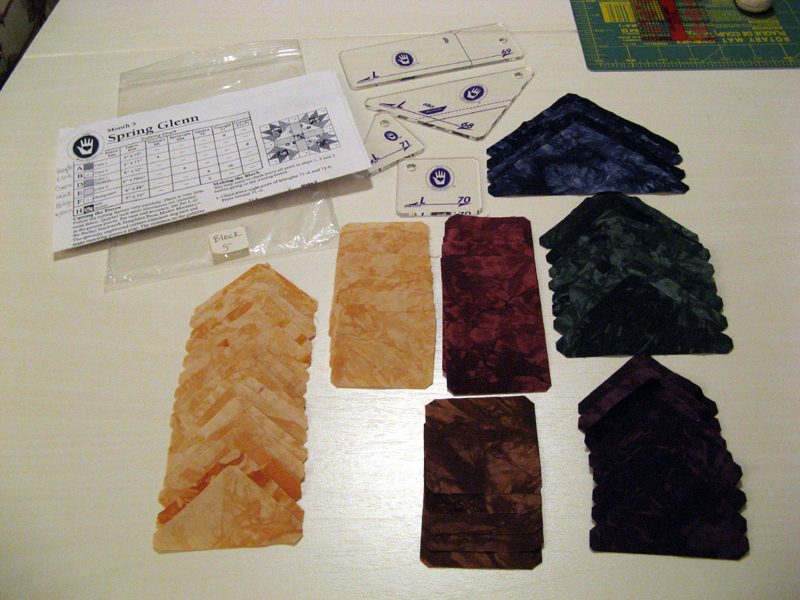 I have mine up-to-date with the last release that was the gift packages. I am anxious to see the expressions first hand on Jennifer's gingerbread men. She added the faces which are quite funny. 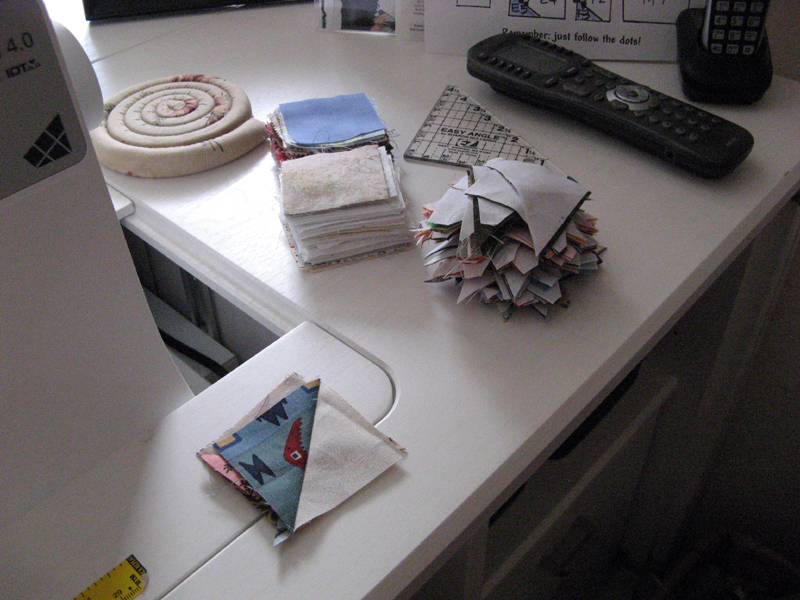 I have way too many project going on presently; very much not me! Not a single one of them were finished last week nor did they need any fabric. Of course this means no change to my stash stats...soon though you'll see lots of yardage used. There are several others linking in to Patchwork Times sharing their stash stats. 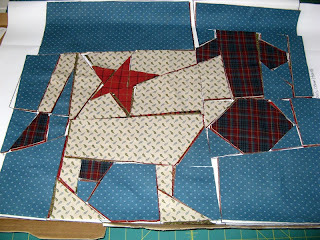 This is the next cow to be assembled. You can see that I am bringing in more color. Certainly the current arrangement will not be the end result! 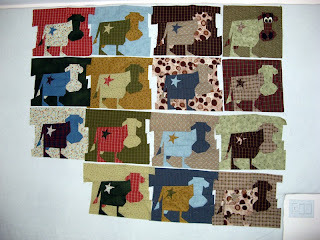 There are also two barns to be added that I plan to get to once the cow are complete. I plan on a day at Kerry's. We will be finishing up the Fur Ball quilt as far as getting it in the mail. 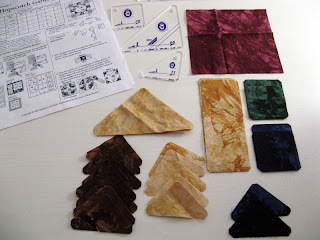 I will be figuring out what's what with the fabrics for the L-Medallion quilt's center. I am anxious to get have that project done for Wendy. 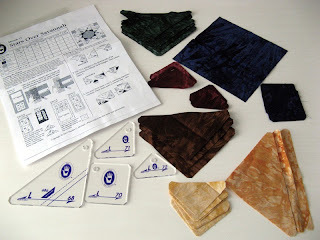 I don't like the results of changing sewing machines in the middle of a project, so that may mean returning to Krossfire for tomorrow's sewing. It is paper pieced and shouldn't matter regarding seam widths. 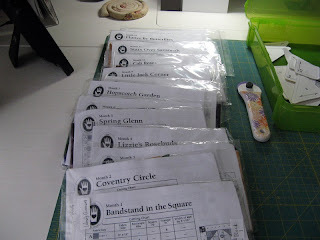 I will go to Kerry's prepared to sew; even though lots of times sewing doesn't seem to work into our days together recently. There is a new baby to enjoy! What have you got scheduled for today? Today during my lunch break and a bit before dinner was ready I finished cutting the strips that are needed for all 12 center stars of Krossfire. I wanted to make sure I would like how the yellows and oranges played together. I was pretty certain there would not be a problem with the purple using either the yellow or the orange. I am happy with the results. That thread in each of the segments is a basting stitch that I use to keep pieces in place when they are shaped in such a way that is easily shifted when the next piece is sewn down. 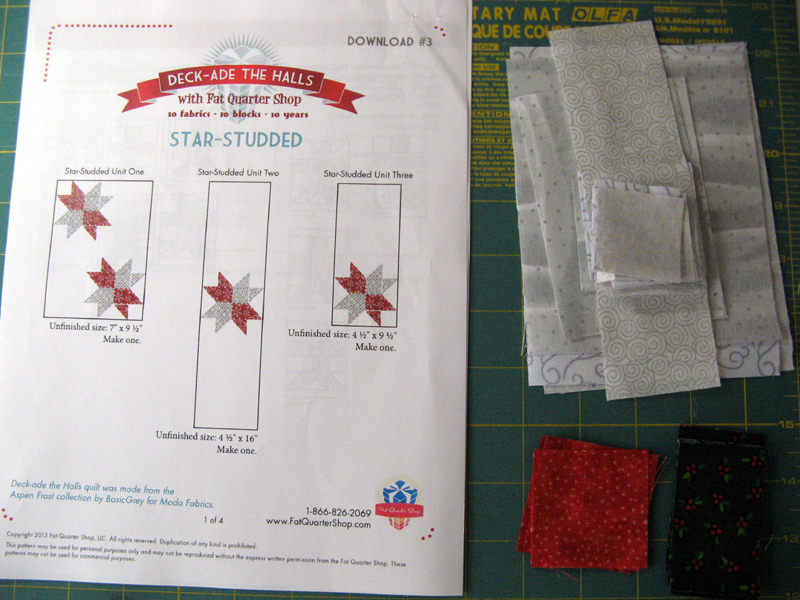 In the coming days I will be making the remaining ten stars. After working a bit on Krossfire I realized that I want to be done with the Krazy Kattle top before my next Buggy Barn class in September. Maybe it would be better if I concentrated on this project instead. This was the cow that I made in class. This is the start of the second cow. There are lots of sections to put together before the cows really look like cows. The body has the most. I will be using a lot of plaids which is a bit different for me. Pizza boxes are used to store and keep in position all the cut pieces. 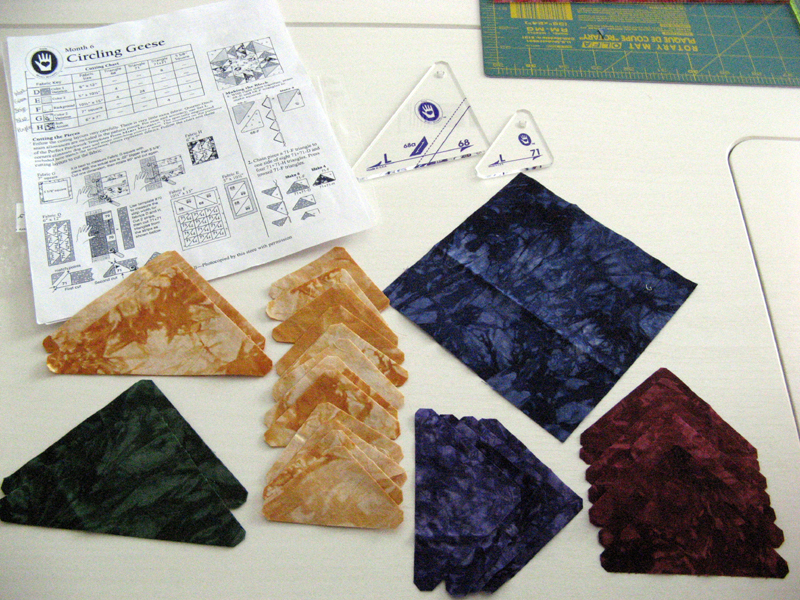 It also helps keep the orientation of the pieces. Just one of the great ideas I picked up during the Buggy Barn classes. Hope to make lots of cows today. Yeah Thursday is here =^.^=. Hope you enjoy it as much as I plan to. Here are the fabrics for Krossfire. I needed to put the L-Medallion project on hold until the weekend. I must determine what fabrics match the key... There isn't much room for mistakes in the BOM project. I have the Deck-ade The Halls done until the next download so... Krossfire, one of the two remaining 2011 UFO projects starts. I am pretty excited about this one. 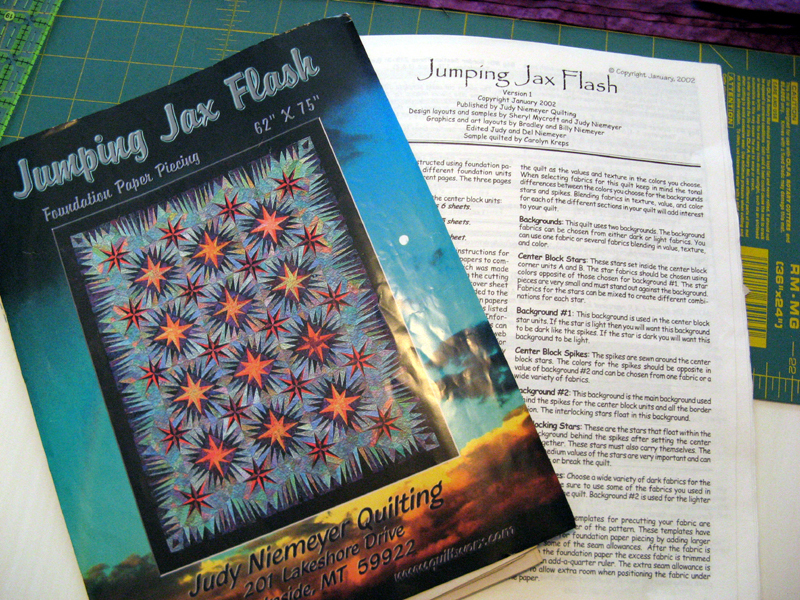 It has the spikes that were popular in 2001 patterns with Judy Niemeyer. You may remember Kartwheels another of my 2011 UFO projects that finished a few months ago had the same design for its borders. This is the first step in the project. The Star Center. 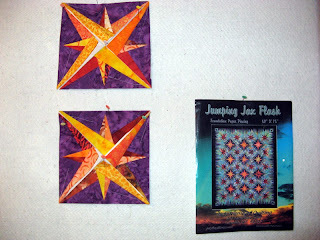 The star is a light and dark where I will be using light shades of yellows to oranges along with dark shades of orange. 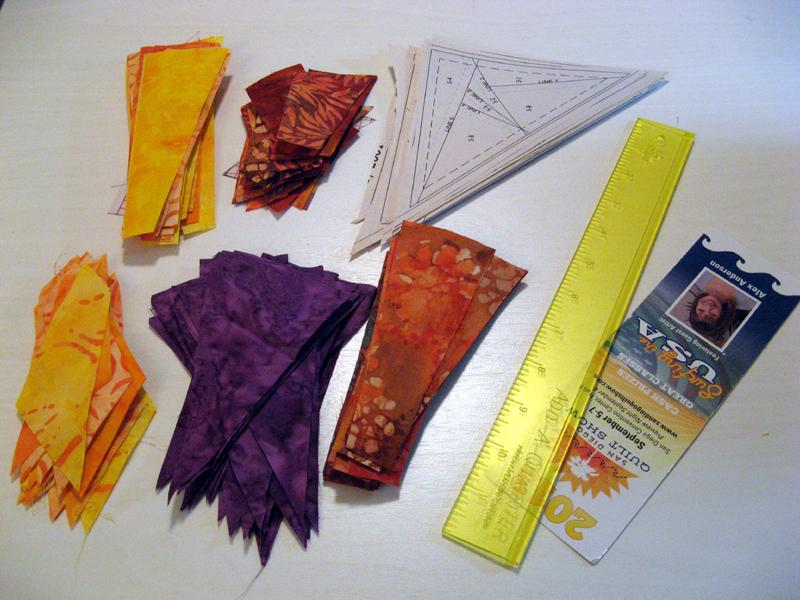 The yellows and oranges are all scrappy. 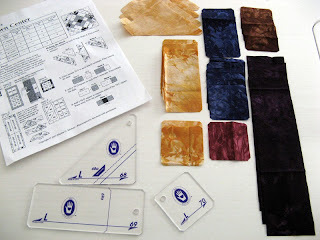 The purple will be the only consistent fabric in the entire project. 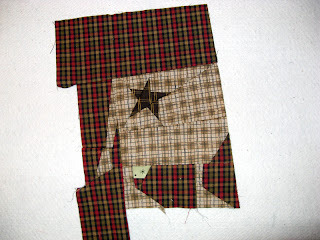 It will be used for the background of the big star. 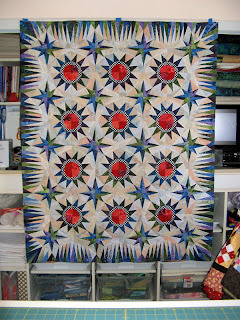 Check out the pattern; there are 12 big stars. Templates made and foundations have been separated. I hope my stash holds up through the entire project =^.^=. 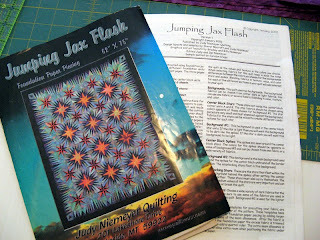 Okay Juli anxious to see what you think as I work through Jumping Jax Flash by Judy Niemeyer. 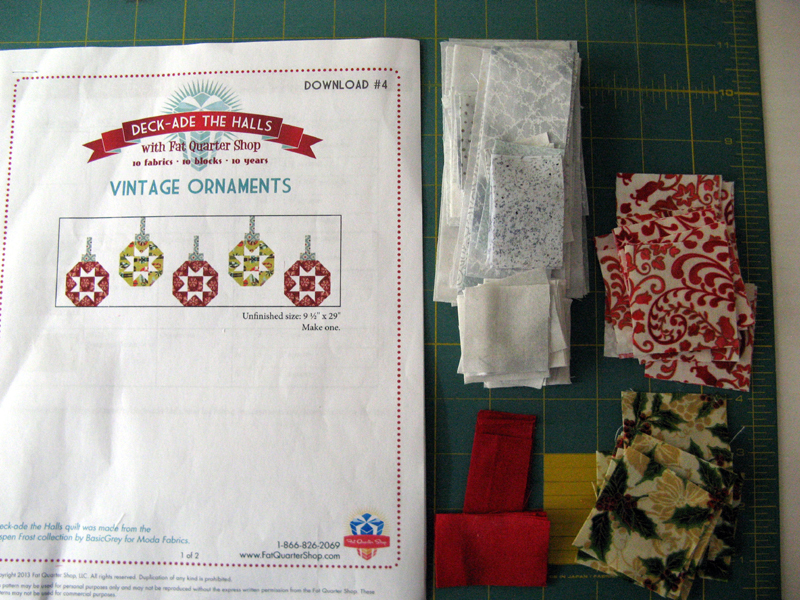 Yippee I'm up-to-date on Deck-Ade The Halls. I'm not sure which package I'd like to tear the wrapper off... Looking forward to Sunday at Jennifer's social where scoops of ice cream will be on hand. It might be a late celebration that she is extending to us since she just celebrated a birthday. Tomorrow I will be back to L-Medallion Quilt. Happy Tuesday and a Happy Birthday to my Sister-In-Law Barbara who celebrates. I am positive my brother Mike will treat her as she should be treated on her special day of the year! 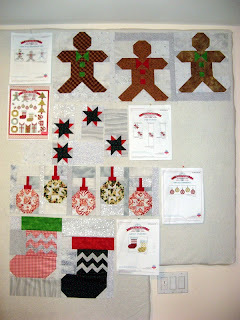 I have a busy Design Wall in my sewing room. 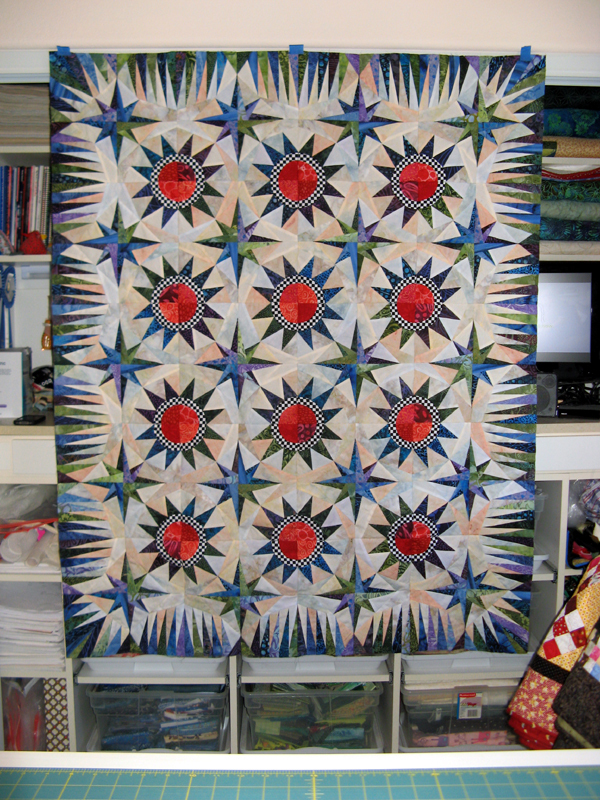 Last week I spent each day working on a commissioned quilt for Wendy by Marti Michelle called L-Medallion. 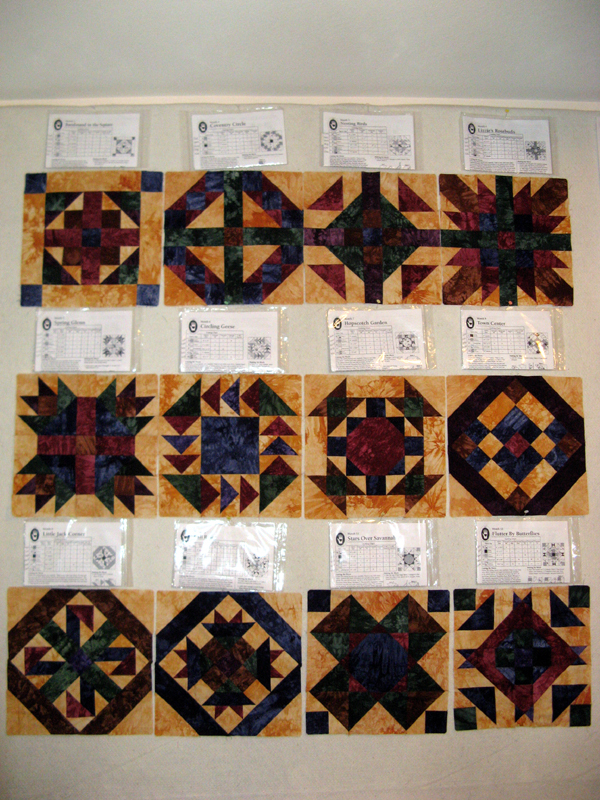 I have all 12 of the blocks done now with the center medallion and the setting to complete. I plan to work on these this week. The center medallion has lots of assembly and cutting out ahead. Month 11 - Stars over Savannah. Month 12 - Flutter By Butterflies. 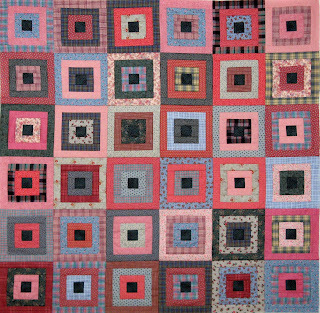 This block again used the L-Template Set by Marti Michelle in ways I didn't think would be. Notice the bottom right shape made with 69A and 72. All 12 blocks ready for the next step in the process! The other side of my Design Wall has Deck-Ade The Halls through Download 5. I think it was Saturday that Download 6 became available. 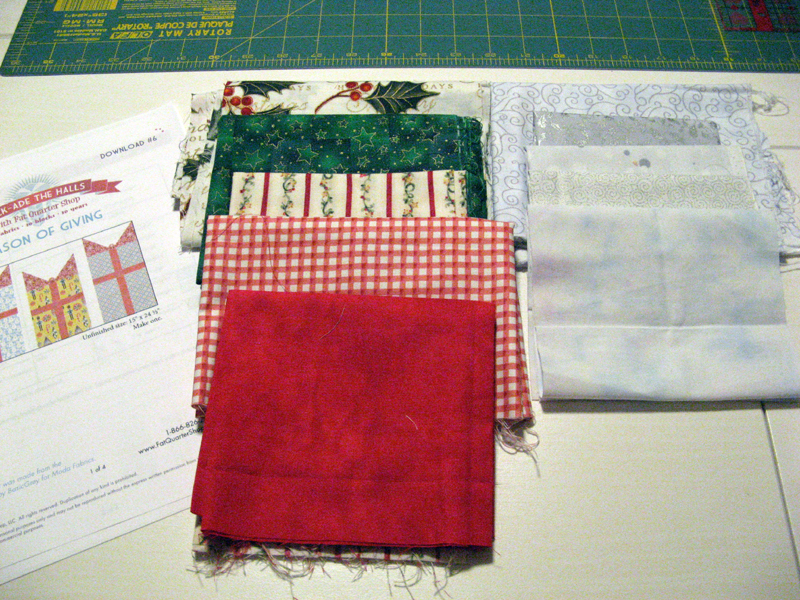 These are the fabrics I will cut for the gift packages. So far my favorite is are the five ornaments. Do you have a favorite so far... 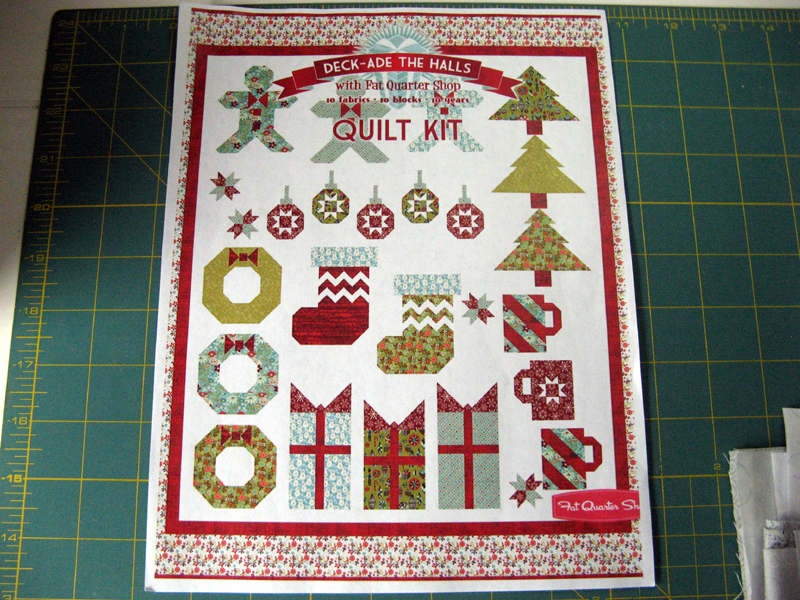 The entire project is available at Fat Quarters Shop. 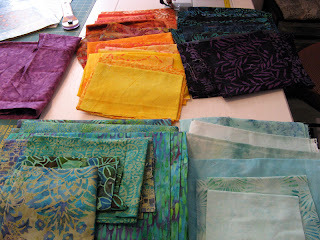 I have a busy sewing week ahead. How about yours? 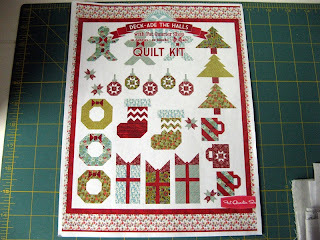 See what others are doing through Judy's linkup at Patchwork Times. 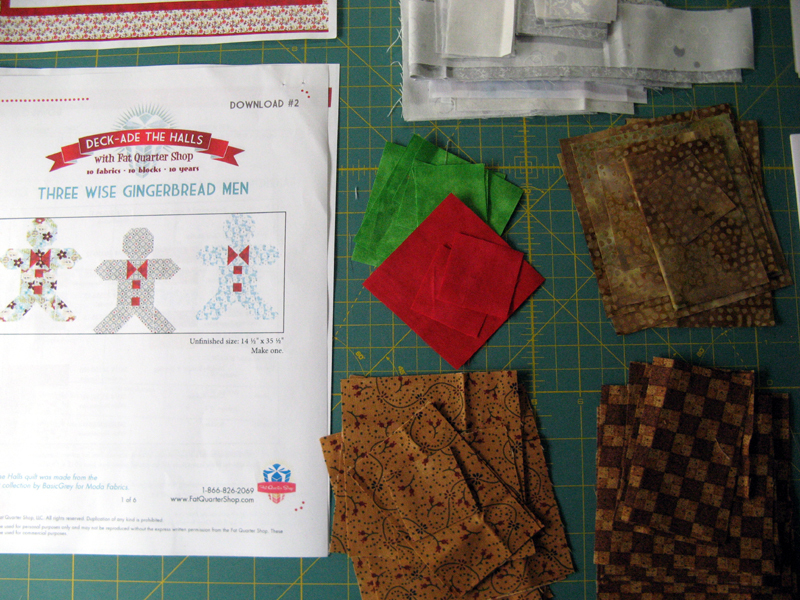 Deck-Ade The Halls is a BOM going on now at Fat Quarter Shop. I'm using up stash with this project. You can still get each of the downloads still by going to their website. They just put out the gift packages download so I've got that one to cut out yet. Jennifer from Sunshine Quilt Guild suggested the project to fill in our summer when we take off from meetings for a couple of months. There is an ice cream social at Jennifer's home next Sunday where everyone can share their progress. I'm planning on being there all caught up! Looks like the ornaments are going to be the most challenging. 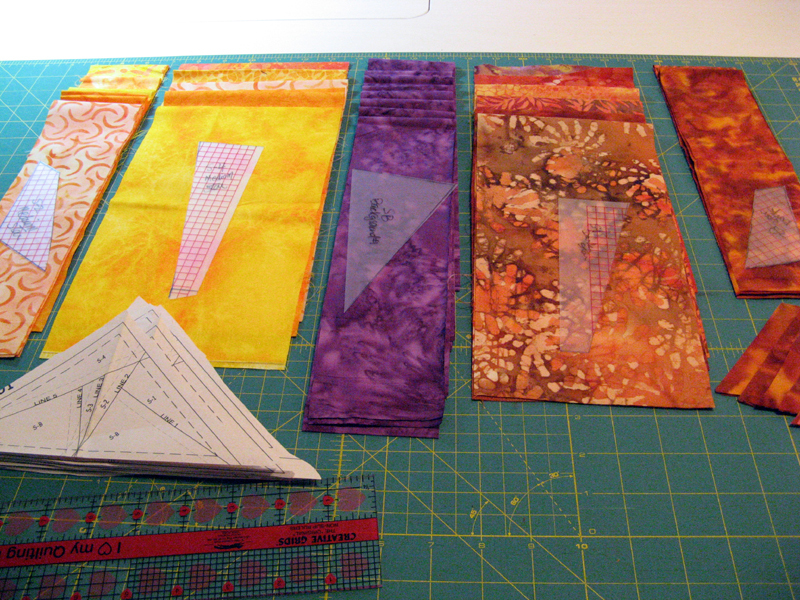 I stayed out of quilt shops all this week. I'm working on a commission quilt that won't change the stash stats once it's done. Deck-Ade The Halls will! No change to my report from last week. See other quilters share how they've been working with their stash at Patchwork Times. 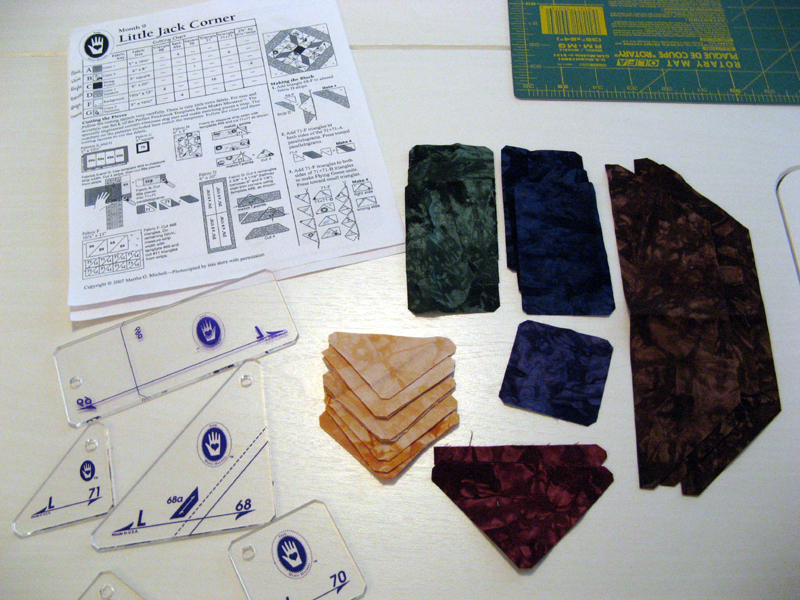 Month 9 - Little Jack Corner. 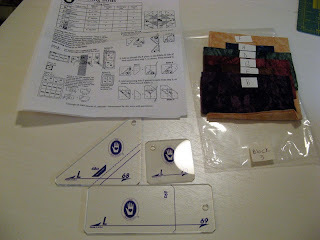 This block used Template 69 and 71 together to make a parallelogram. These Marti Michelle templates sure are versatile. Month 10 - Cali Roses. 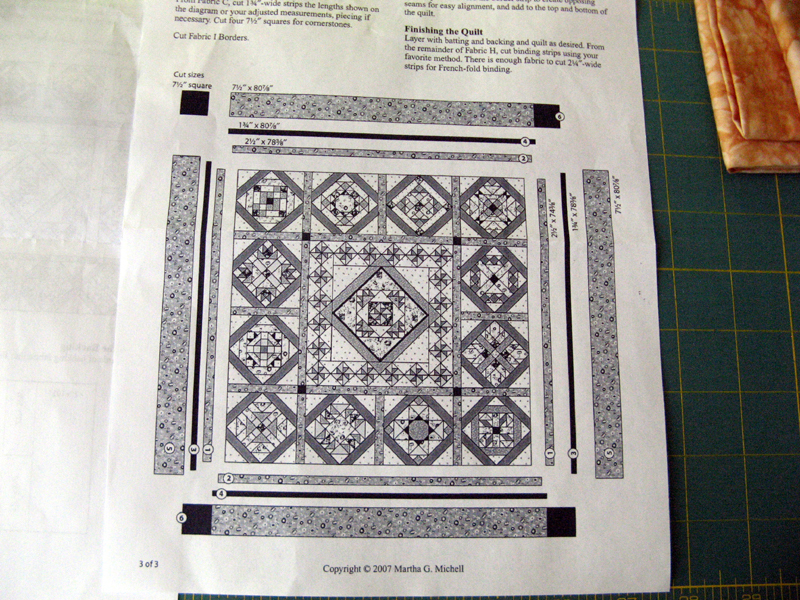 This is the third block so far with the design set inside a dark frame. 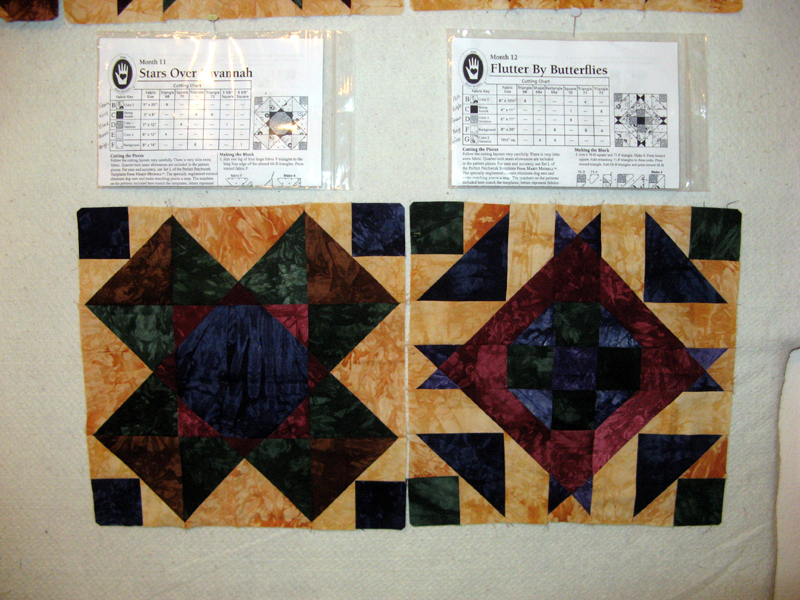 Just two more blocks to cut and sew until the medallion center. Month 8 - Town Center. The dye lot seems to have changed a bit on the purple. 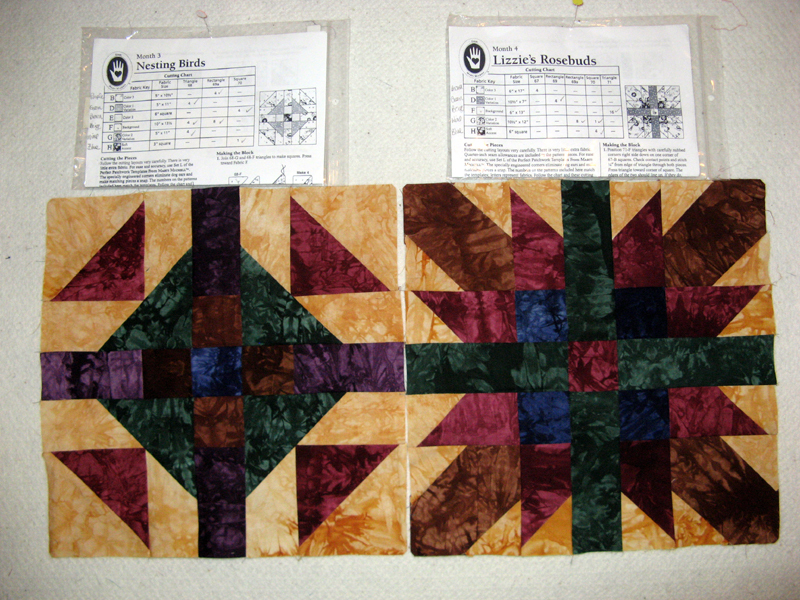 An earlier block had this same shade so I suppose in the end all will be fine. 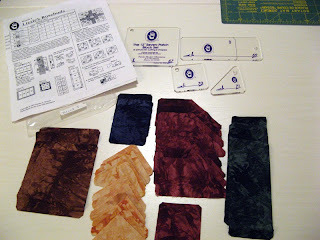 That's the issue (if there is one to be) with hand dye fabrics. No way to come out the same with each lot. Next up Month 9 and 10. I have already started the cutting on these two. May have a second post on progress later today. 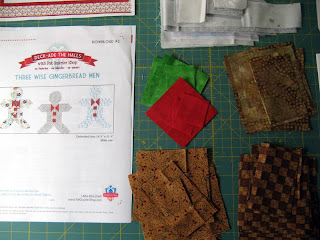 Tomorrow I've got a "use up stash" project just started. I'm going to be up to date next Saturday when Jennifer has us gather at her home to share progress....... Enjoy every bit of Saturday! Month 5 - Spring Glenn. 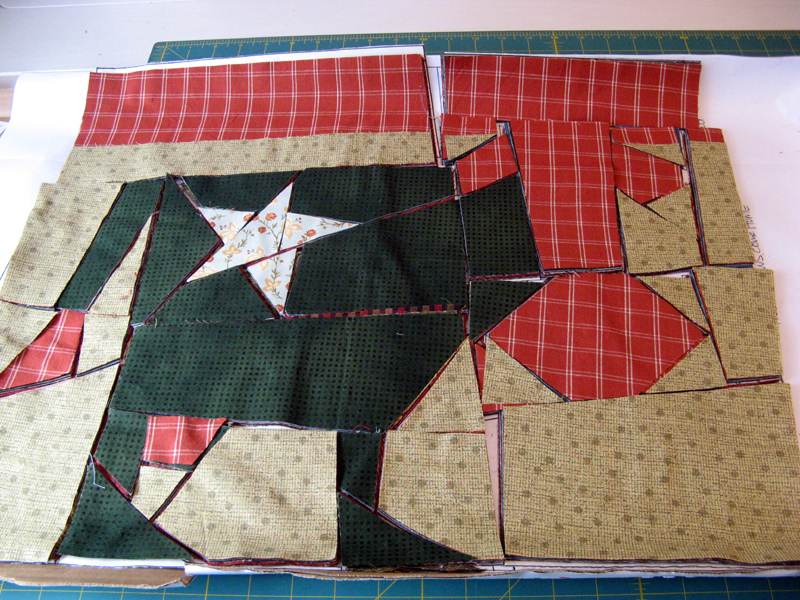 This block has had the most pieces so far to assemble. 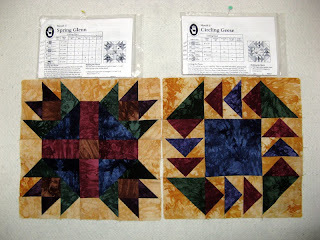 Month 6 - Circling Geese. I'd been warned this project was a bit slight on fabrics. I was bitten with this block. 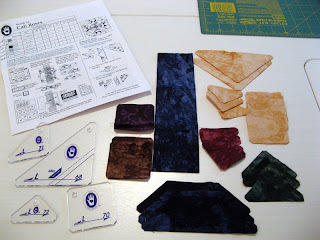 Fortunately I have some scrap pieces from two other projects that filled in. Month 7 and 8 are next. We have an unusually cool day in San Diego. Enjoy your Friday. 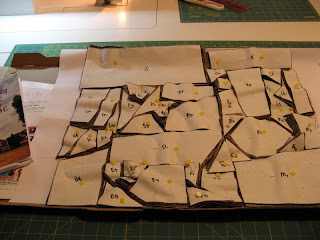 Month 3 - Nesting Birds cut and ready to assemble. It was first to sew. Month 4 - Lizzie's Rosebuds cut and ready to assemble. Second up. 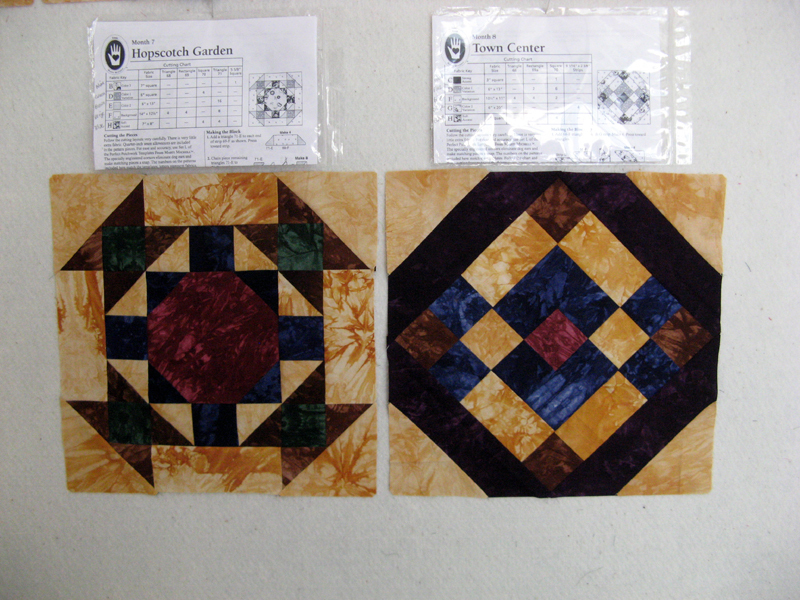 Two more finished. I'll be working on Month 5 and Month 6 next. =^.^= Enjoy your Tuesday! 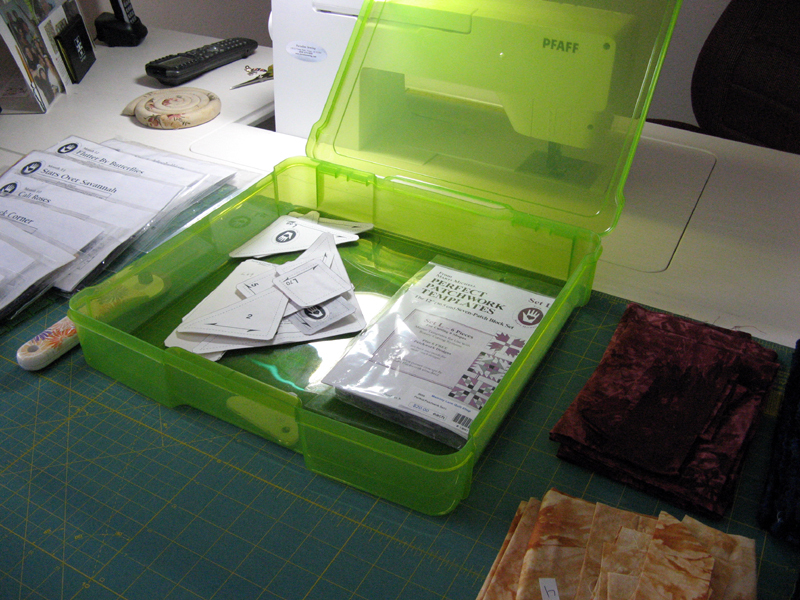 Sunday I opened the next project's box to see just what I was supposed to sew. 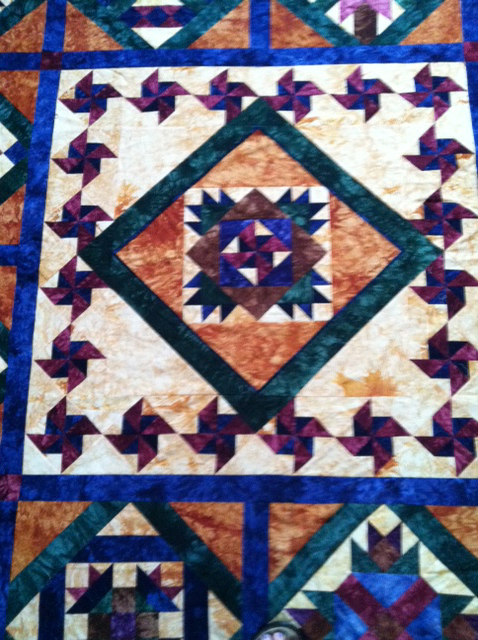 This is a commissioned project designed by Marti Michelle called Set L Medallion. It is a Block of the Month where as it turns out I have all the blocks now. Each BOM has its own fabrics that will all use Set L templates. There are some very rich hand dyes to be used. 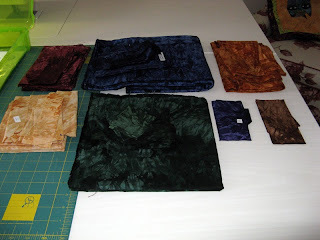 These are the different fabrics starting with wine, blue, gold, beige, green, purple, and finally brown. Month 1 - Bandstand in the Square in pieces using three of the six templates of Set L. Fabrics purple, beige, green, blue, wine, and brown. 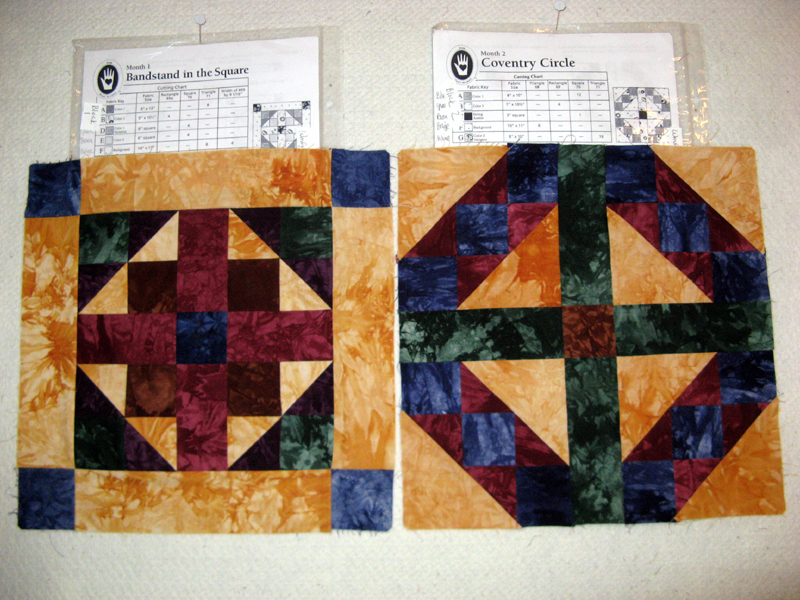 Month 2 - Coventry Circle in pieces using three of three of the six templates of Set L. Fabrics blue, brown, green, wine, and beige. 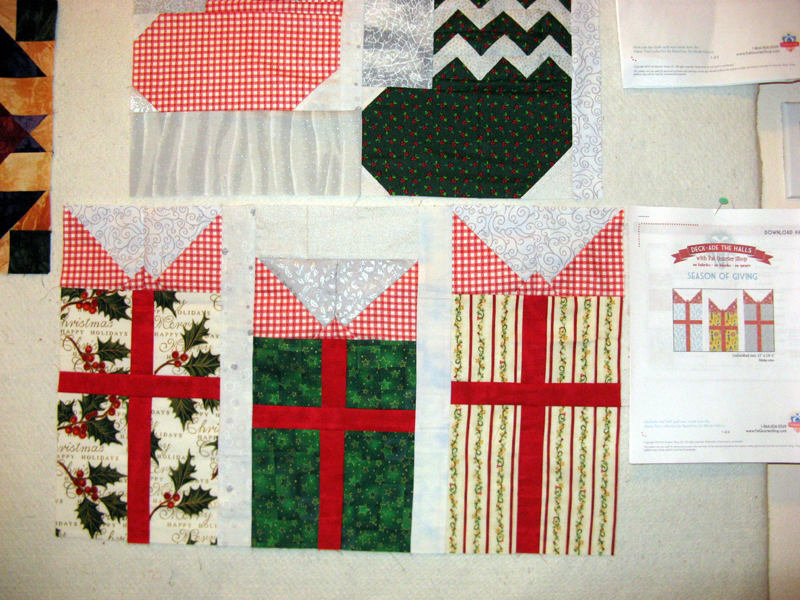 Here is how the first two blocks turned out. Beige as you can see is the background fabric. 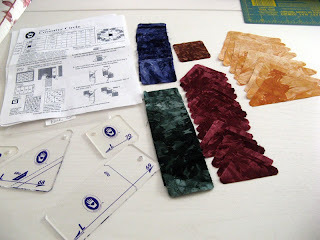 Marti's templates make for easy assembly. 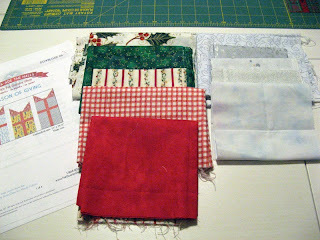 I find it real necessary to use scant 1/4" seams for everything to play well together. Next up is Month 3 - Nesting Birds. I'll be using beige, blue, green, wine, brown, and purple. Three of the six templates of Set L.
I should have more blocks done when I post next time. Come back and check out how this project comes along. 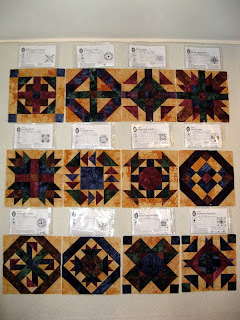 There are lots more quilters doing wonderful things in their sewing rooms across the globe. 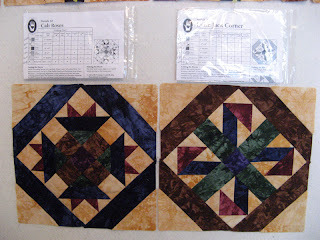 Find time to see what others are up to through the links at Patchwork Times. Today I have two finishes to report. 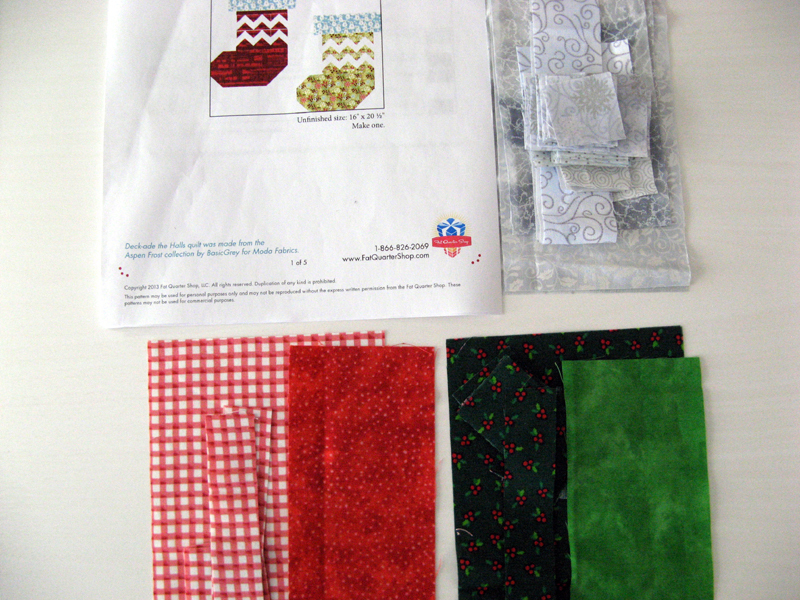 Layer Upon Layer a pattern by Country Threads that is my July 2013 UFO Challenge. This project went together so quick. The pattern calls for a Layer Cake, but instead I used nothing but stash. The constant center block fabric is also the back plus a little more of a couple of the plaids. These fabrics aren't my "go to" colors...maybe that's why it was easy to find them all in my stash...guess at one point they were. I'm sure you know how that goes =^.^=. Thanks to Janet O for coming up with the cute name. I'm anxious to see what Aunt Marti selects as our challenge for August. 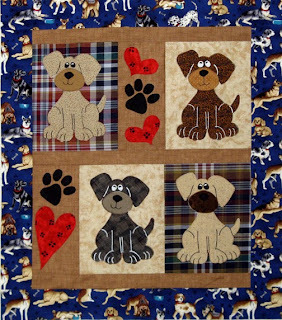 I Love Puppy Dogs by Patti Bartlett of Heart String Treasures was selected this year for the event. 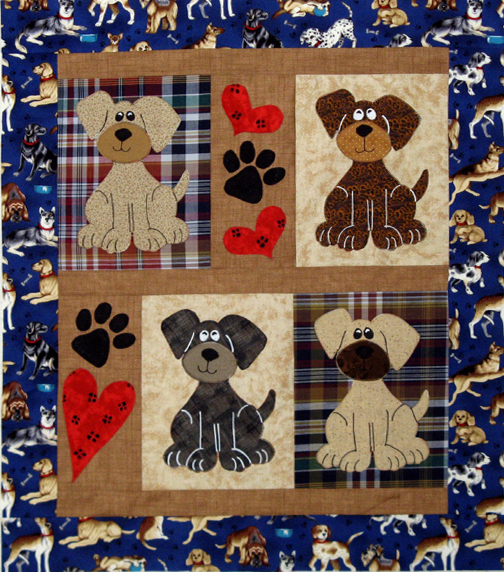 Kerry and I have been donating a quilt (or two) annually now for nine years to help raise funds for the animals during this black tie gala. The quilt becomes part of a "Home" basket that is auctioned. Next year we plan to put smiles on cat lovers with cat theme :)! My next project is commissioned. It was started and then shelved. The owner still wants it done so I'm going to pick up the pieces and finish it. There will be more about this project tomorrow so tune back in to see what I'm up to next. I'll leave you with my stats on this middle of July Sunday. 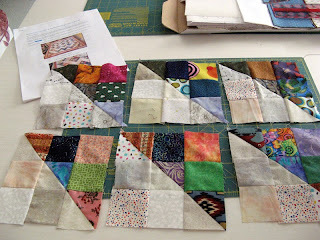 There are lots more moving their fabric stash around that you can read about through the links at Patchwork Times.